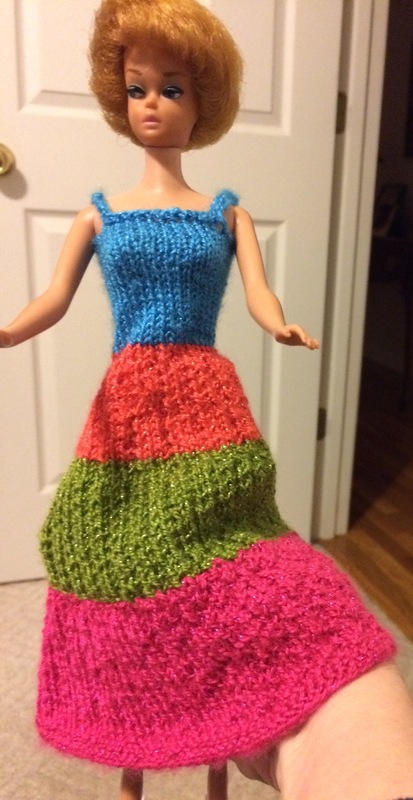 The pattern from Sticka till Barbie (#11) called for a complicated rib pattern. I had to change it up to make it simpler. I did a K1P1 rib throughout. 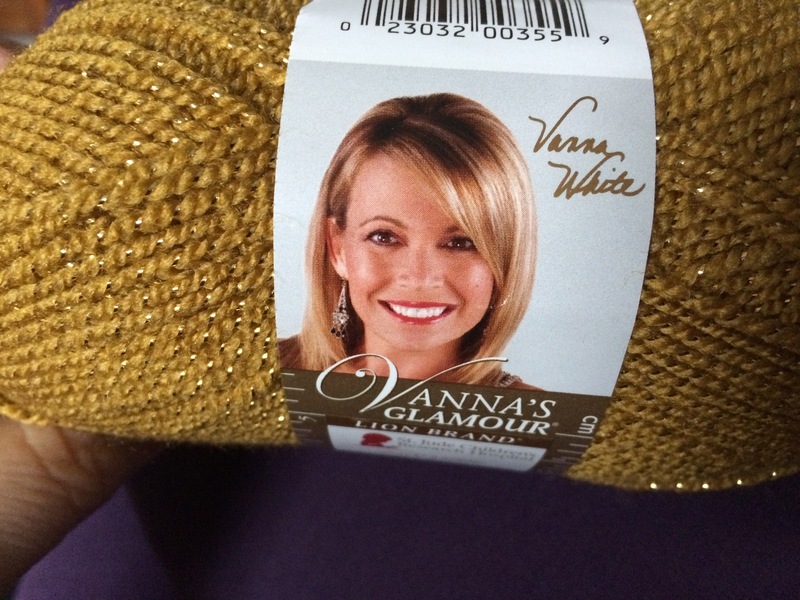 I knit while I’m watching TV, and a complicated pattern is too much to keep up with. That’s why the rainbow dress had so many mistakes. I was watching Panther football! I did have to pay some attention. First of all, it called for an odd number of stitches. 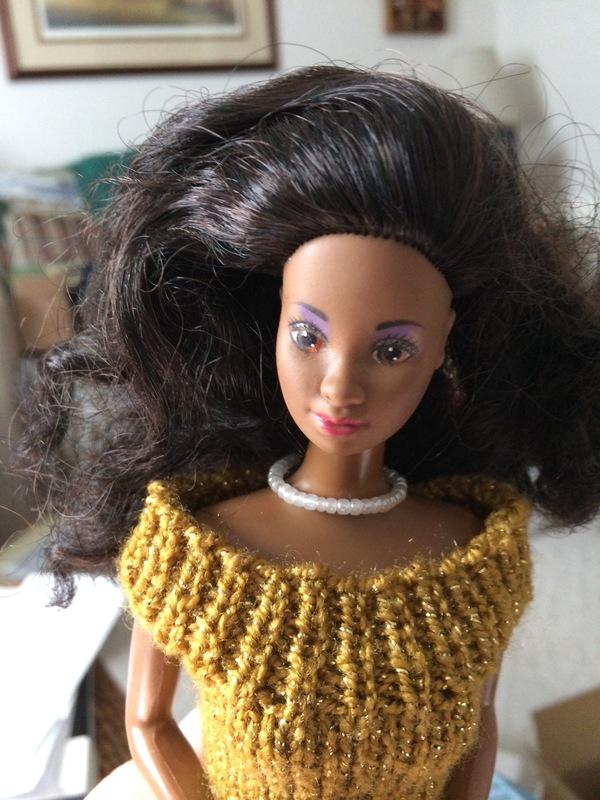 I had to make sure I was knitting my knits and purling my purls on the wrong side. Otherwise, I would have done a seed stitch. 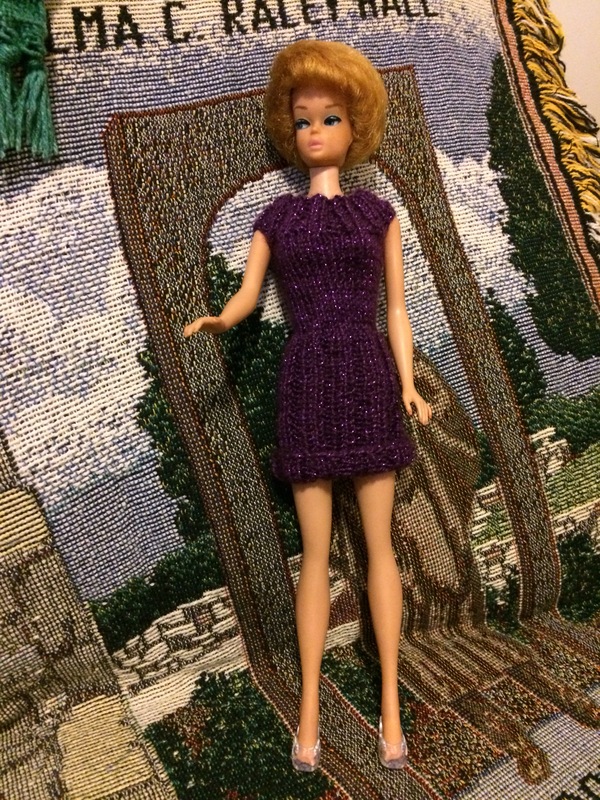 Seed stitch is not my favorite, though I may try a skirt, someday. Speaking of skirts, the top of this dress did not look like it was working out right. 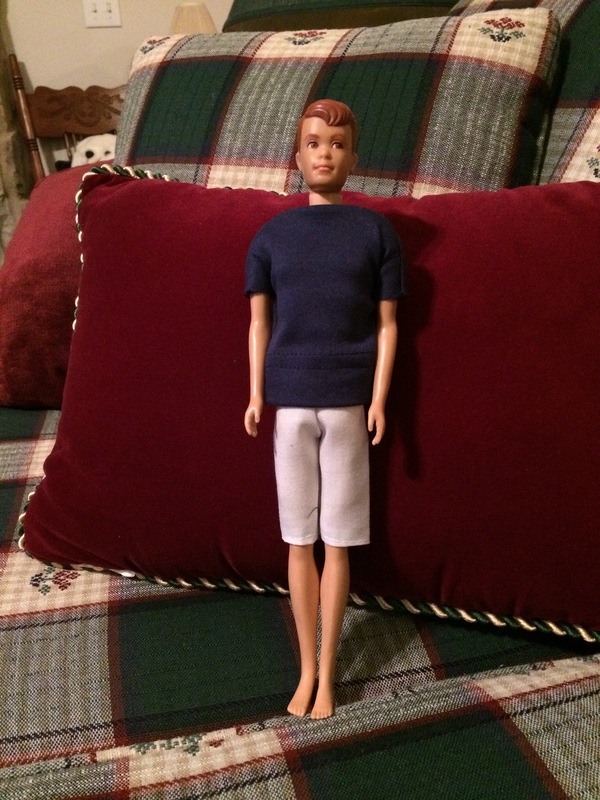 I thought at one point, that I’d unravel it back to the skirt part and just cast it off. I printed a copy of the pattern and highlighted all dimensions, stitch counts, cast offs, and decreases. Everything else was changed to K1P1. It came together just right! The finishing directions weren’t complete, but I figured it out. 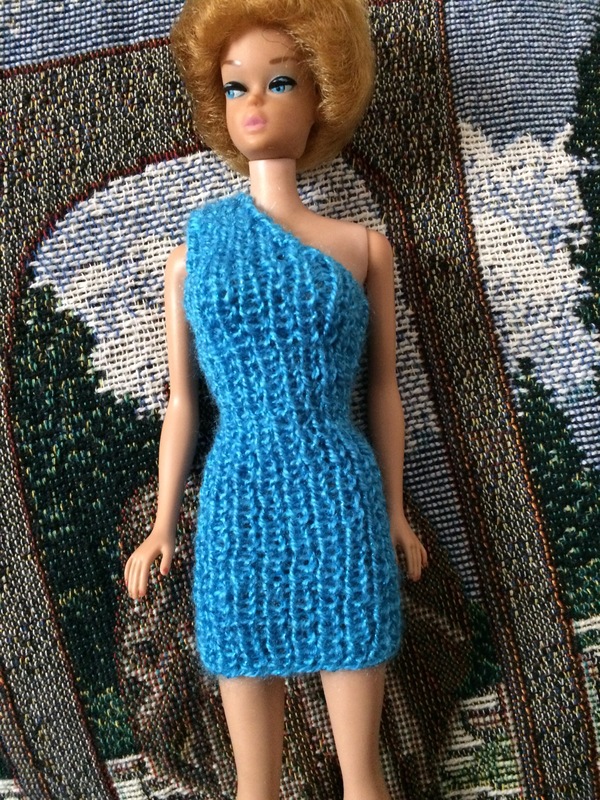 Kent says it looks like a Wilma Flintstone dress! Maybe I need to string a few chunky beads! 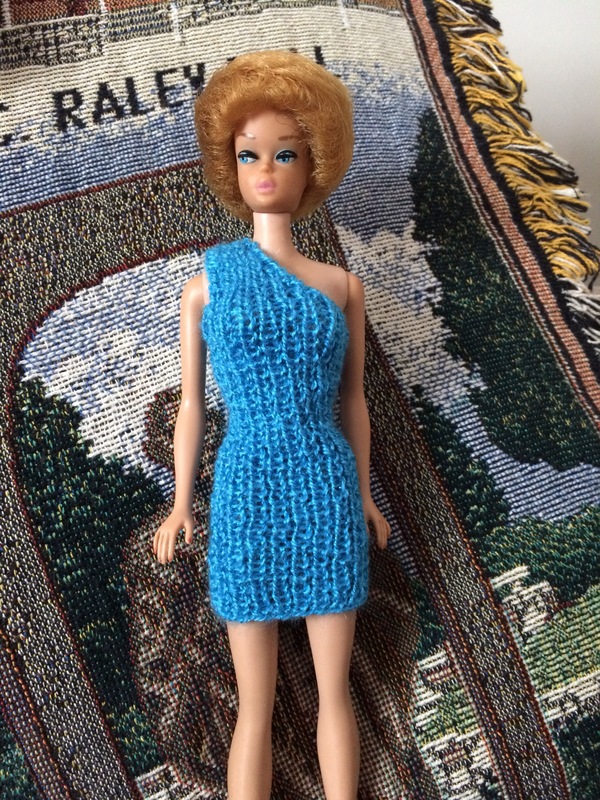 Filed under doll clothes, knitting and tagged Barbie, doll clothes, knitting |	Comments Off on Wilma? 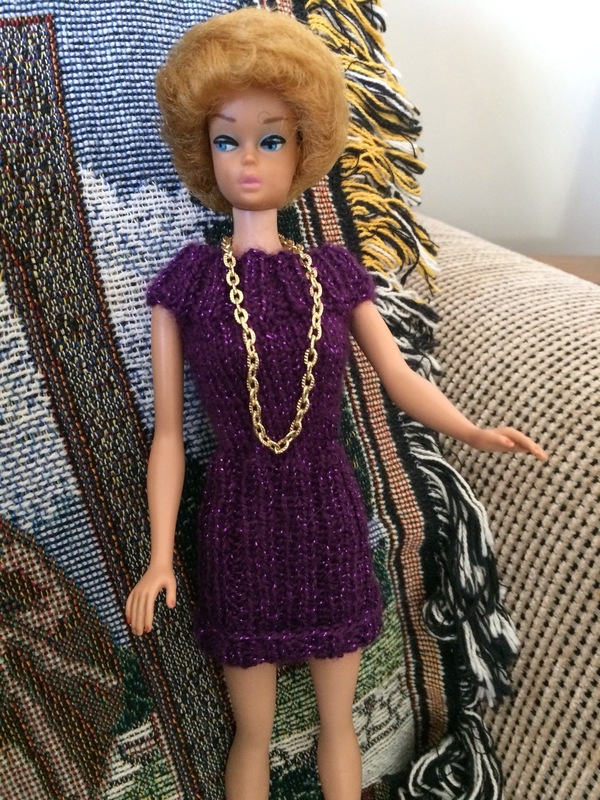 I put together a simple chain necklace for Barbie. I hope she doesn’t look like a rapper! K2P2 rib stitch. 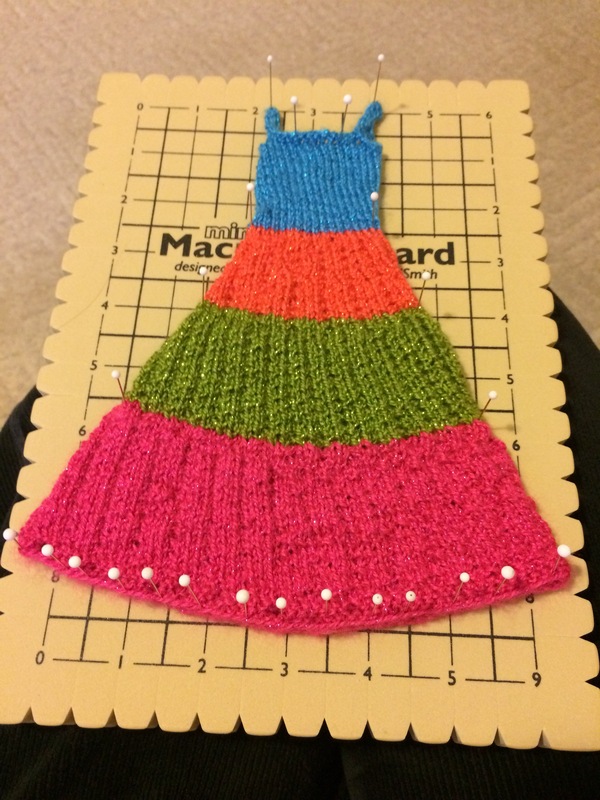 I accidentally knit the right side of the bodice to the wrong side of the skirt, so I flipped up the hem. Ta-da! 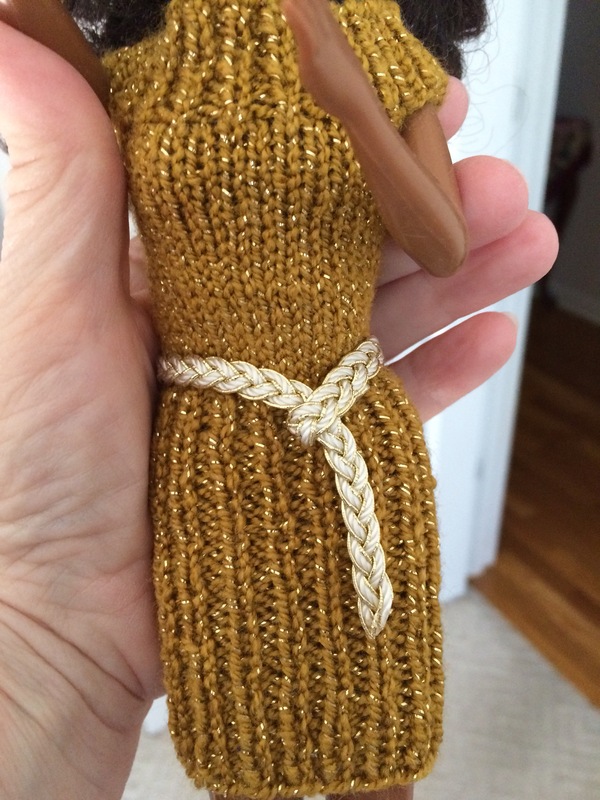 I used Aleene’s Fashion Fusion glue “pen” to make a loop on one end of this tiny trim. I also used it, like fray check, to secure the V-shaped cut I made on the other end. Easy! Blocking didn’t remove my mistakes, but it did give this dress a better shape! This time I got the rib pattern right, and instead of casting off the top of the skirt, I just changed to stockinette stitch and kept going. I tried to make the arm holes bigger for Wonder Woman’s buff arms. It didn’t work, but I’m still happy. 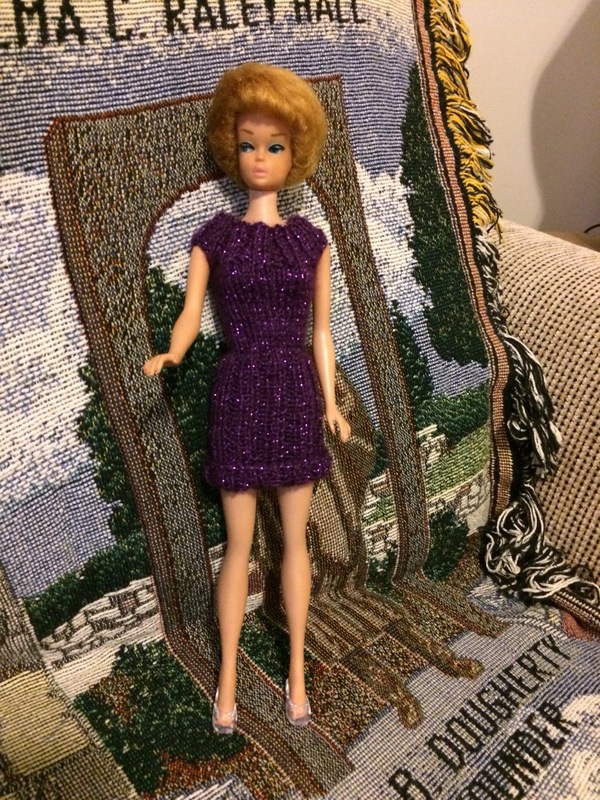 This model is Dee Dee from Barbie and the Rockers, another basement find! PS: no way! 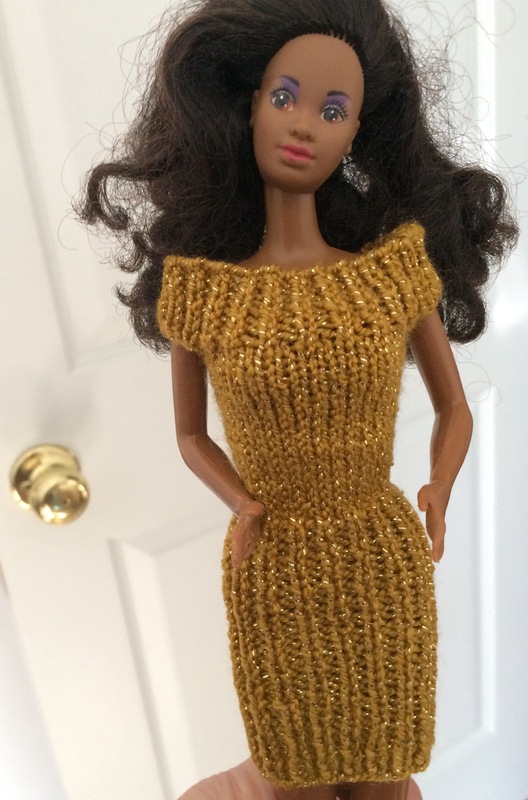 I pulled up the pattern and the instructions were ridiculous! 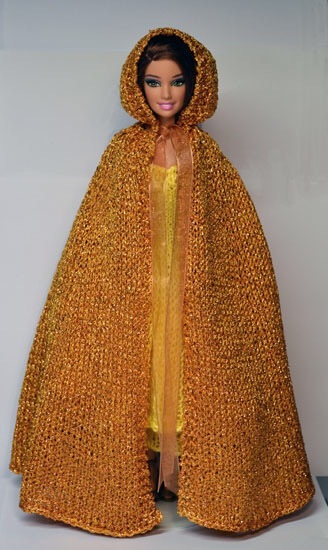 It was knit top down with bunches of increases. I think it’s much easier to decrease, so I’m going to reverse engineer it and create my own! Yes, I have lost my mind. That navy t-shirt Allen is wearing is one of the hardest things I have sewn in years. I got this crazy idea. 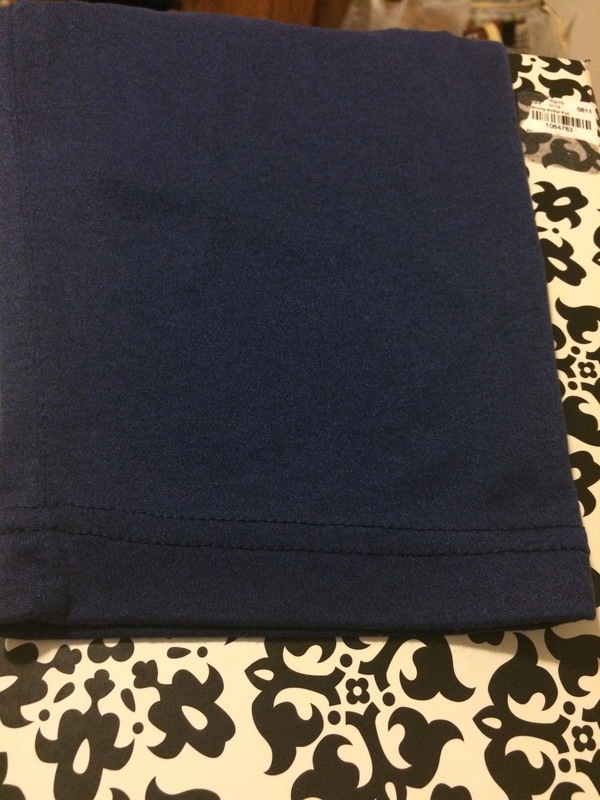 When I wear out sweats and tee’s, and they’re too far gone to donate, I recycle them into dust cloths. 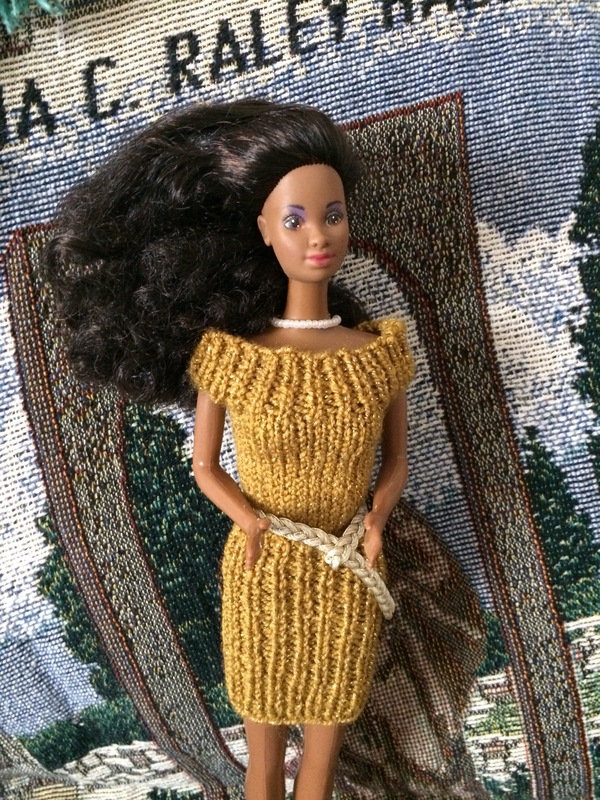 Small bits and pieces get tossed, so why not make doll clothes from them? 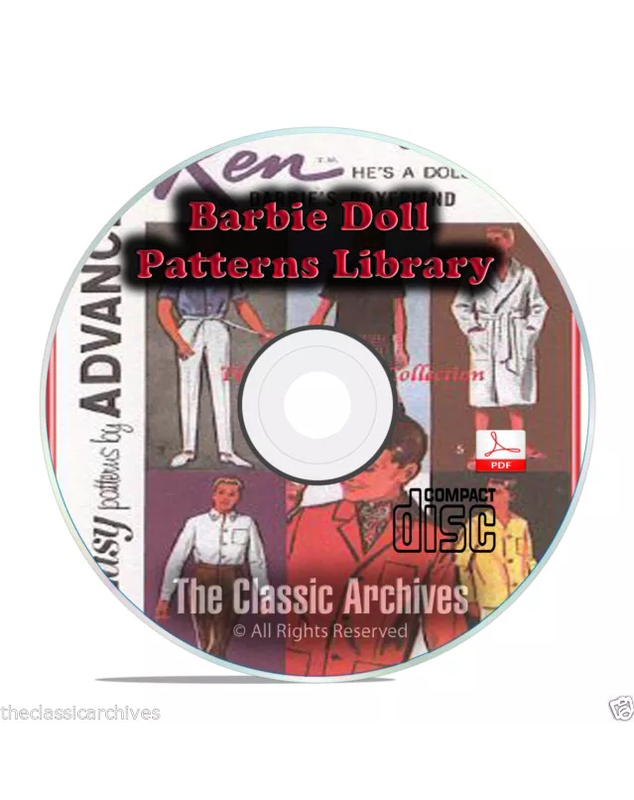 I recently ordered this collection of Barbie and Ken doll clothes patterns. They are from The Classic Archives on eBay. 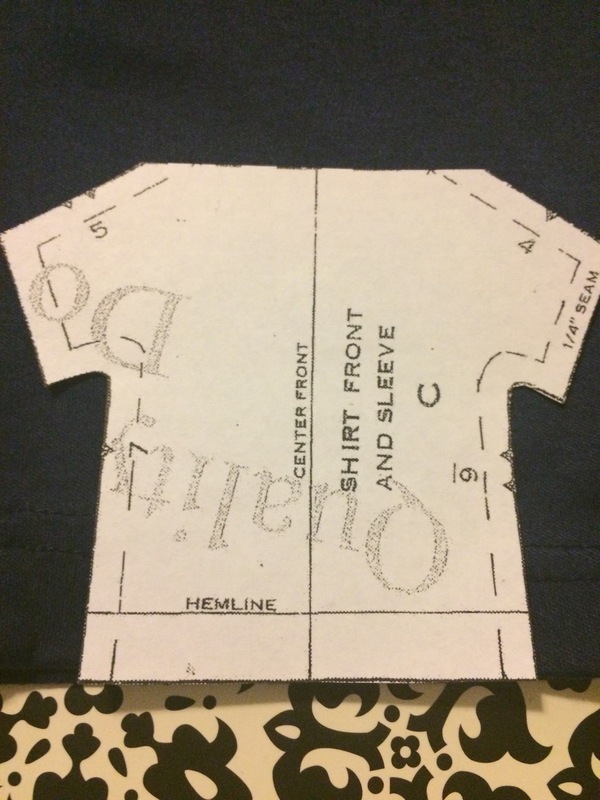 I printed the pattern for the simplest male t-shirt I could find on the disc. 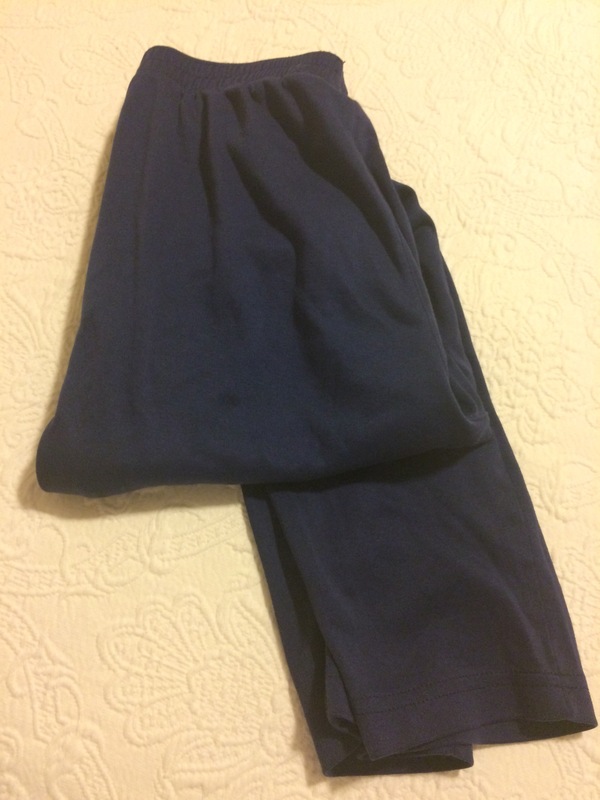 I pinned it to the hem of one leg of my old beloved navy knit pants. My sewing pins we’re at Mama’s, but I found some T pins at home. After I cut it out, I took the shirt pieces to Mama’s and attempted to sew them on my machine. The seam allowances were so small, the feed dogs just chewed the soft jersey knit. The bobbin wadded and knotted three times. I re-threaded at least four. 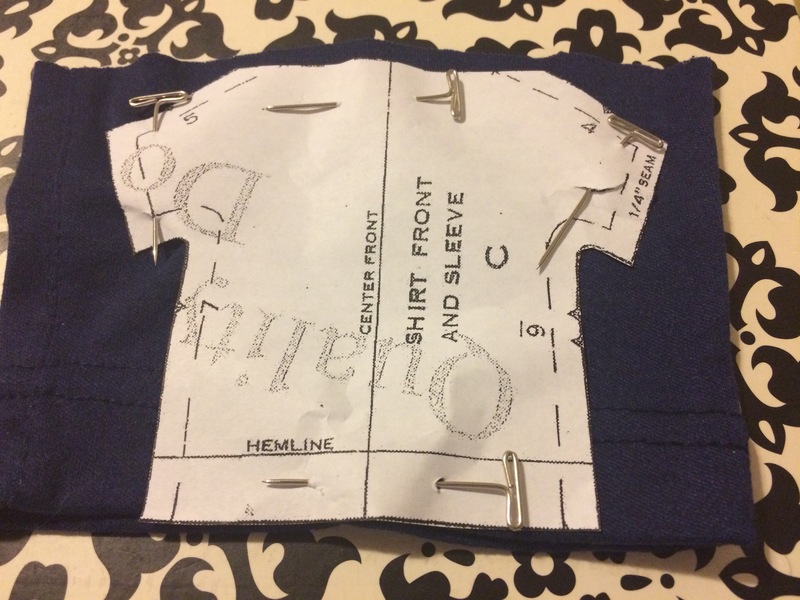 If I try another shirt, I’ll sew it by hand.